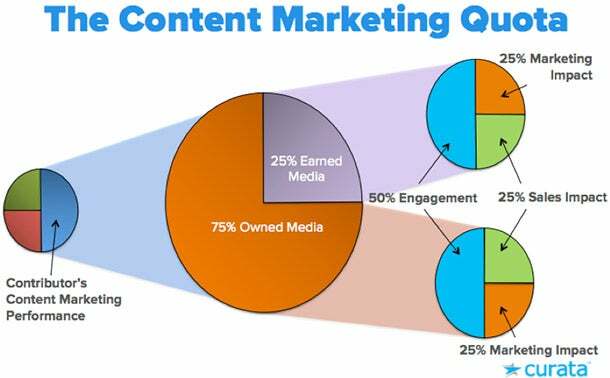 Smart marketers know that content marketing metrics can be used to optimize future strategy. But, these same metrics can also be used to reward and incentivize individual contributors. Incentivizing a content marketing team — similar to how many sales teams function — can keep the team accountable and boost results. Your content marketing team, right down to individual writers, can be held responsible for achieving not only a certain level of content output, but also a certain level of content performance. You might tailor this model based on your own needs and situation. Perhaps your team must contribute a certain number of pieces per week (a quota based on frequency) to be eligible for a bonus or they’re expected to grow the readership by a certain amount each month (a quota based on readership). When writers know they’re being held accountable for results, they’re more likely to brainstorm relevant topics and refine their approach to suit readers’ needs, which often translates to better engagement and results. These marketers will use tools such as BuzzSumo to select topics that are timely and keyword-driven. Calls to action—whether leading the reader to download an e-book, or buy a product—are a key component of content marketing; and when writers know they’ll be rewarded for positive results, they’ll often work harder and create call-to-actions that convert to fulfill their Marketing and Sales Impact portions of their quota. In some companies, sales, marketing and social media exist in separate silos. When sales impact and social media metrics are components of individual performance, it helps incentivize marketers to work with the sales and social media teams so that everyone gets on the same page in terms of goals and messaging. Performance bonuses encourage writers to take ownership of their work. They also find it gratifying when they see that their efforts are helping grow revenue. Plus, earning some extra cash never hurts. Before implementing quotas, think carefully about what benchmarks to use. If you set the bar too high and the numbers are unattainable, it could actually de-motivate people and lower morale. Set it too low and they may not take it seriously or achieve their full potential. Be open to honing these standards over time, and you’ll be on your way to optimizing your content marketing.